Italian grammarian and Hebrew poet of the first half of the fifteenth century. 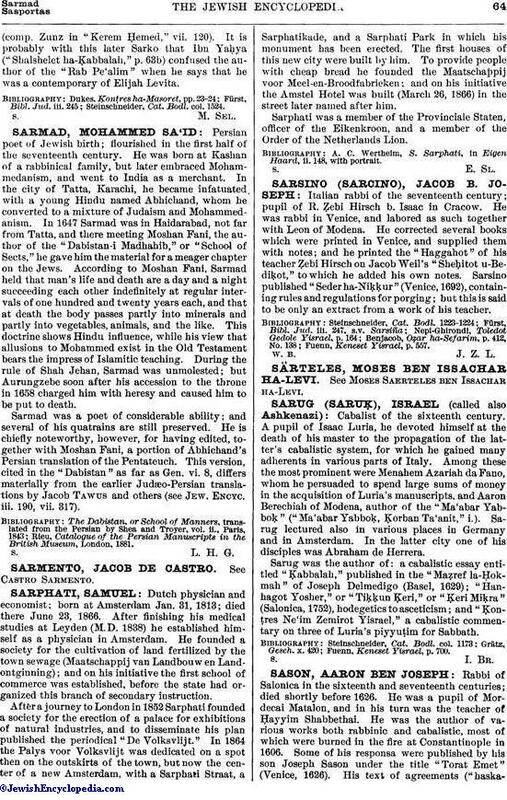 According to Carmoly ("Histoire des Médecins Juifs," p. 129), he was a native of Naples and one of the teachers of Judah Messer Leon. He was the author of "Rab Pe'alim," an analytic Hebrew grammar divided into several sections. He states in the preface that he terminated this work on the first day of Elul, 1429. The part which deals with numbers ("Sefer ha-Misparim,") is printed at the end of August Justinian's edition of Ruth and Lamentations (Paris, 1520). 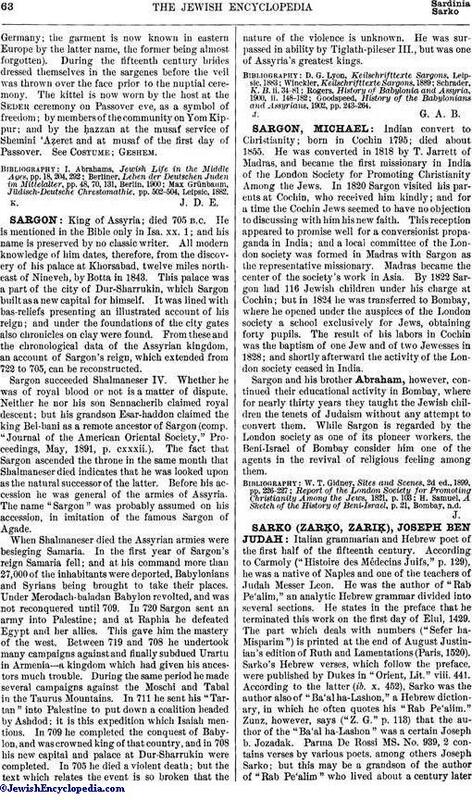 Sarko's Hebrew verses, which follow the preface, were published by Dukes in "Orient, Lit." viii. 441. According to the latter (ib. x. 452), Sarko was the author also of "Ba'al ha-Lashon," a Hebrew dictionary, in which he often quotes his "Rab Pe'alim." Zunz, however, says ("Z. G." p. 113) that the author of the "Ba'al ha-Lashon" was a certain Joseph b. Jozadak. Parma De Rossi MS. No. 939, 2 contains verses by various poets, among others Joseph Sarko; but this may be a grandson of the author of "Rab Pe'alim" who lived about a century later(comp. Zunz in "Kerem Ḥemed," vii. 120). It is probably with this later Sarko that Ibn Yaḥya ("Shalshelet ha-Ḳabbalh," p. 63b) confused the author of the "Rab Pe'alim" when he says that he was a contemporary of Elijah Levita. Steinschneider, Cat. Bodl. col. 1524.